We’ve talked a lot about blogging the past two months. And I’m sure we will continue to talk a lot about blogging until the world ends or I stop blogging, whichever comes first (I hope it’s the world ending). So today, instead of talking about the content of the actual posts, I thought we should go over what should appear on the sidebar of your blog. 1.) A search bar — You want your readers to be able to search for their favorite posts. Additionally, a search bar is great for readers who happen onto your blog and want to see if you said anything about their favorite topic. I do this often if I stumble upon a blog I have never been to before but like the first couple posts I read. Did they have a life-changing post on company bios? If so, I want to read it. 2.) Subscription box — Make it easy for readers to subscribe so your post will appear in their email inbox every morning. If they’re willing to do that, they really like you, so don’t make them search for it. 3.) 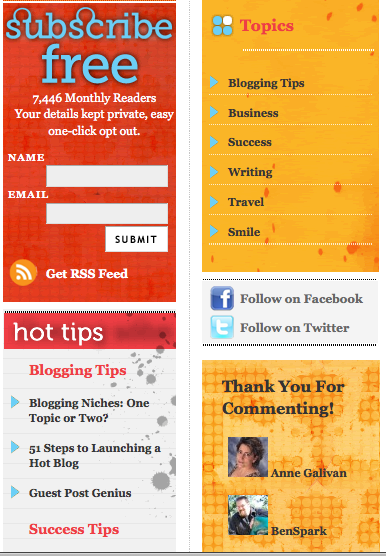 Recent posts — Have your last 5-8 posts lined up and ready for new visitors to read, or old visitors to return to. It also adds a bit of legitimacy to your blog as it reassures visitors that you’ve been busy blogging and they should trust you. 4.) Blog archives (by month)— This is another way to eventually add validity. By having your archives on your sidebar you are showing readers how long you’ve been blogging, and making it easy for them to see what you’ve written about. 5.) Categories — Each time you post, you should be adding your post to ONE category. Make sure those are on your sidebar. On my sidebar you’ll see I have 11 (although I should get rid of uncategorized as it’s pretty useless). That way if you ever want to read every blog post whose main attraction was Twitter, all you have to do is click and you’ll find it right away. 6.) Social media icons — If people are reading your blog, and like what they’re reading, they may want to connect on more levels. Make sure they can find your Facebook, Twitter, LinkedIn, etc as easily as possible. Also make sure there is an RSS feed for anyone who uses Google Reader or the like. 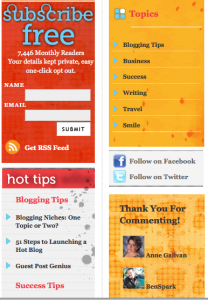 Your sidebar should make it as easy as possible for readers to navigate your blog. It should invite readers to stay longer and read past posts and get to know you. What do you look for in a sidebar? 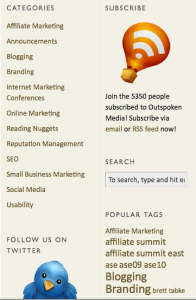 Is your sidebar up to par? Is there anything I forgot in my list? you knock my socks off. Thank you for all the blogging tips!